Wae Rebo is perhaps the most unique cultural icon on Flores. 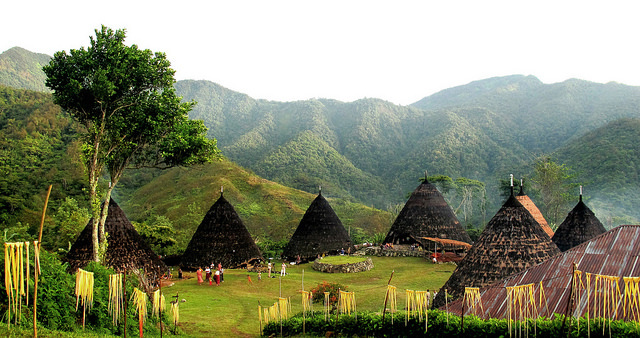 A series of houses built according to ancient Manggarai design. Resting atop a hill in the caldera of an long-dormant volcano, surrounded by fog-shrouded forests…this is a stunning location. 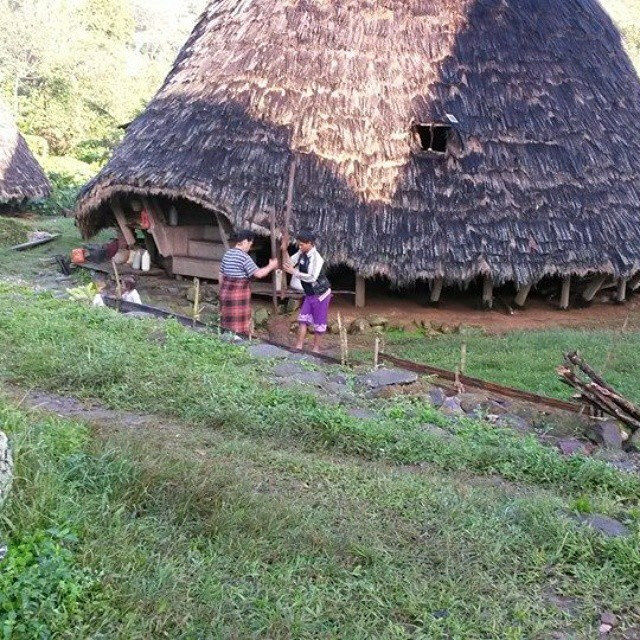 With no roads or electricity, yet rich and very enriching…each visit brings a sense of timelessness. Our Wae Rebo Trekking trips offer different routes for the hardened trekker and the relaxed explorer. 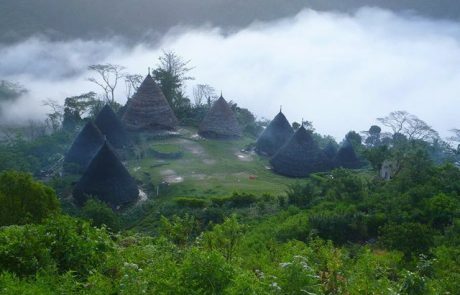 The Wae Rebo base camp is home to the only Turtle conservation center on Flores and is part of the vast Savu Sea Marine Protected Area. This means pristine seas, silent nights under crystal clear skies and more than 1.5 km of beach reserve. 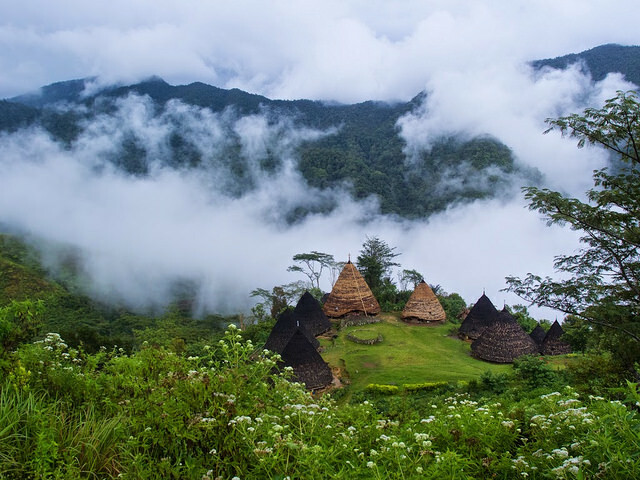 Then a trek through the ricefields of remote Southern Flores as you slowly ascend towards the cloud forest that enshrouds the Wae Rebo UNESCO site. 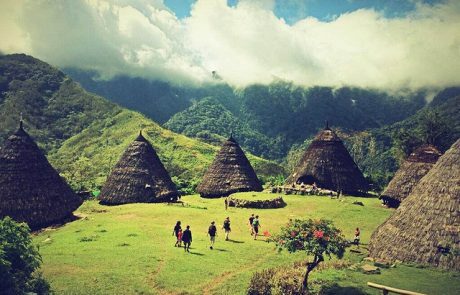 This trek, the places you sleep, the people you meet are all part of a unique and truly rewarding journey. Click on image for zoom in. This options takes us from sea level to 1,300+ meters in series of ascents through valleys, villages and ridges. The final leg ascends to approximately 1300 meters over a pass to the west of Wae Rebo while trekking through dense forest. The trail is taken by locals but is not developed. Nearly all conditions from dry savannah at the beginning to moist cloud forest will be passed through. Expect mud at all times of year. 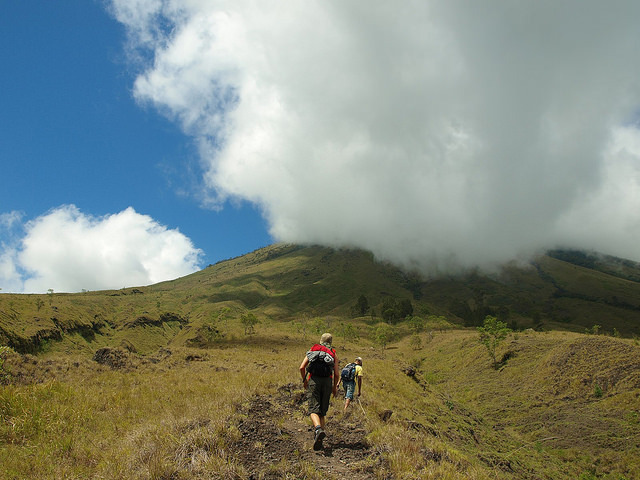 This trek is for experienced trekkers only. Estimated time – 5 hours. The less strenuous route, this option is a short transfer from our base camp and we start at Denge Village, just north of Dintor. The approximately 7km trek is well trodden. This does not mean it’s simple! However, it is accessible to most people, including children 10 years and up. 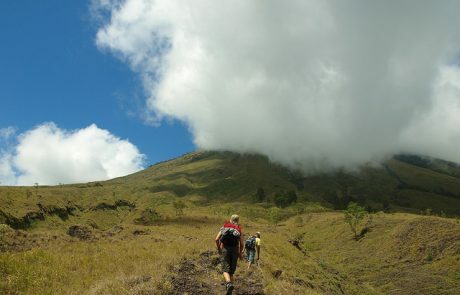 The trek is about a 750m slow but continuous ascent. This usually means around 3 hours at a gentle pace and 2 hours for the practiced trekker. This route would overnight at our own Turtle Conservation Camp – Panta Hera – for sunset, dinner and chat around the fire pit. From here, atop the cliffs we can head out for the nightly beach walks, looking for obstacles for nesting turtles, checking on nests and enjoying the long beach free from light or sound pollution. 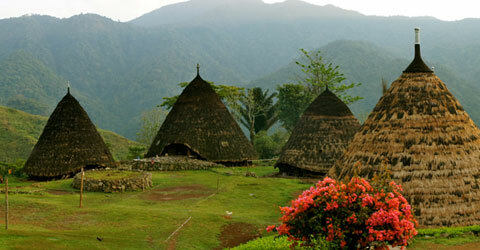 Day 1 – Depart Labuan Bajo 10:00 to accommodate early morning arrivals from Bali. Arrive 15:00 at the base camp and turtle conservation center. Join the team for evening beach clean and then a clifftop dinner overlooking the Savu Sea. Simple accommodation in bunkhouse or inside tents atop the cliffs. Day 2 – If you wish, you can join the team in seeking new nests and checking protective fences on our sunrise patrol. Then ascent up the challenging trek. 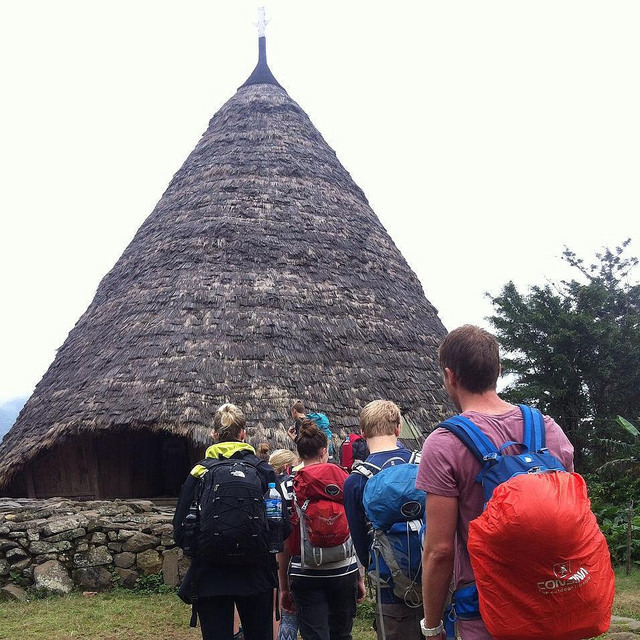 If you chose the moderate trek, we have a short transit to departure point. 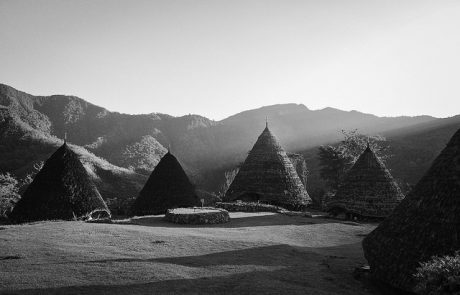 Lunch en route on challenging route – otherwise, lunch at Wae Rebo village. 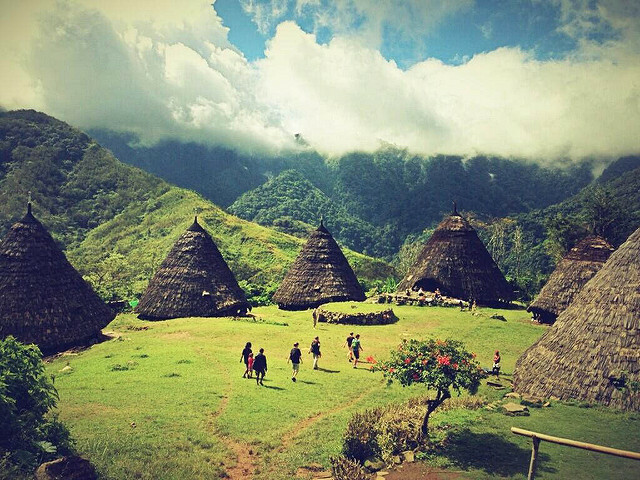 Enjoy the village and enter a different pace of life. 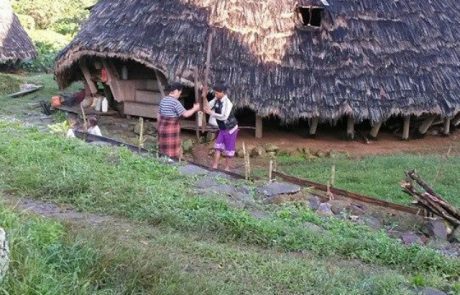 Simple meals served and then sleep inside the massive traditional house. Day 3 – Early rise for a stunning sunrise in the caldera of this long dormant volcano. Freshly grown/roasted/ground coffee to start the day while surrounded by the cloud forests. Then a hearty breakfast before the descent. Sleep at base camp. Day 4 – Another stunning sunrise and turtle nest check. 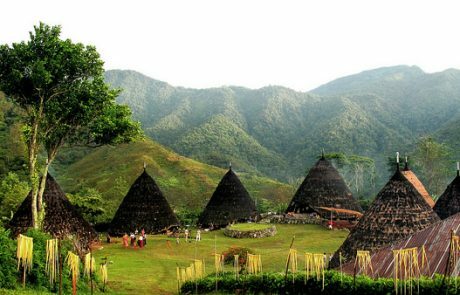 On the return trip to Labuan Bajo there are opportunities for a waterfall trek (about 200m descent and ascent), visits to traditional farms, and many amazing vistas. If an afternoon departure is scheduled – we can arrive in Labuan Bajo by 14:00. As always, Wicked Adventures and our staff make every effort to assure your safety but there is no way that we can prevent accidents and acts of God. This is not an ordinary trip, so please purchase travel insurance that covers you for remote locations and potential evacuations. We have continual contact with the base camp and can arrange care for almost any accident or incident that happens – but we may not be near to a facility that can cater to our needs. 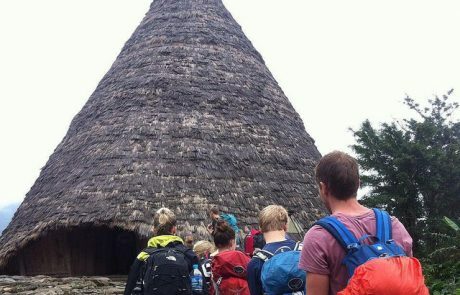 We recommend Nomads as a very good company designed for these kind of expeditions.